Omi-Hachiman (近江八幡) is Edo Style town located south of Lake Biwa. It is also known as the birth place of Omi merchants. 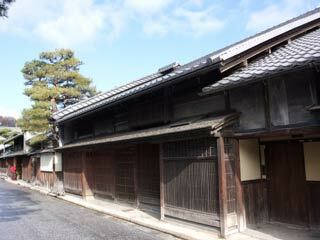 There are many houses of Omi Merchants which remain since Edo period. Some of those are opened as museum and many of traditional houses still offer the site of Omi city in Edo Period. This Edo style scenery is oftenly used for Samurai Story Movies. There is a parking near the museum, and you can get a map of Ome at the museum. Omi-Hachiman was built by Toyotomi Hidetsugu in 1585. When he built Hachiman Castle, he removed all merchants and people from Azuchi to under Hachiman Castle. At that time, Omi-Hachiman became one of post towns of Nakasendo Road. Because Hidetsugu made set Omi-Hachiman Tax Free Market Town (Rakuichi-Rakuza), many talented merchant gathered at this town and made a great economic growth of Omi-Hachiman. Hachiman Castle was abandoned in 1595, but Omi-merchants remained here and kept growing their economy. The areas of Shinmachi Street, Nagaharacho Street, Hachiman Canal, and Hachiman Shrine are registered as the historical asset and preserved sites. Therefore, those spots offers the sites of Omi city in Edo period. all located at Shinmachi Street.